^ 1.0 1.1 1.2 1.3 岛崎邦彦. Mid-plate, plate-margin, and plate-boundary earthquakes and stress transmission in far east. International Symposium on Continental Seismicity and Earthquake Prediction. 1984: 132–147 [2019-02-12]. （原始内容存档于2018-11-28） （英语）. ^ 崔在和; 佐藤裕. 朝鮮半島における歴史被害地震. 地震. 1995, 48 (2): 483–486 [2019-02-12]. （原始内容存档于2018-06-04） （日语）. 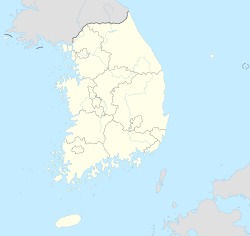 ^ 3.0 3.1 3.2 Significant Earthquake - 1936-07-03 - SOUTH KOREA. 美国国家海洋和大气管理局. [2019-02-12] （英语）. ^ Event 903729 South Korea. 国际地震中心. [2019-02-12] （英语）. ^ 5.0 5.1 5.2 Hayata, K. Report of the Ssanggyesa strong earthquake on the southern foot of Mount Chiri. Bullet Meteorological Observatory Government General of Tyosen. 1940, 1: 145–157 （日语）. ^ 吴忠良. 韩国地震学研究的基本情况简介. 国际地震动态. 1996, (2): 21–24 [2019-02-12]. （原始内容存档于2018-02-12） （中文（简体）‎）. ^ Lee, K. Earthquakes. (编) D. S. Lee. Geology of Korea. Korea: Kyohaksa Publishing. 1987 （英语）. ^ 8.0 8.1 Lee, K. Earthquakes in Korea from 1905 to 1945. Bulletin of the Seismological Society of America. 2003, 93 (5): 2131–2145 [2019-02-12]. doi:10.1785/0120020176 （英语）. ^ 1938/08/22 09:46:27.0 - 朝鮮半島南部 - M4.8. 日本气象厅. [2019-02-12]. （原始内容存档于2018-12-06） （日语）. ^ 우리 역사 속 강력했던 지진은?. YTN사이언스. 2014-04-01 [2019-02-12]. （原始内容存档于2018-11-28） （韩语）. ^ 강석기. 한반도는 지진의 안전지대인가. 동아사이언스. 2004 [2019-02-12]. （原始内容存档于2018-12-01） （韩语）.